alaTest has collected and analyzed 20 reviews of TP-Link LB110. The average rating for this product is 4.6/5, compared to an average rating of 4.5/5 for other products in the same category for all reviews. We analyzed user and expert ratings, product age and more factors. Compared to other products in the same category the TP-Link LB110 is awarded an overall alaScore™ of 87/100 = Very good quality. Great bulb for a great price. Love this with Google Home and even Google Assistant through my phone and Android watch. 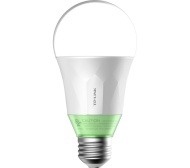 Great smart lightbulb, I am able to tune the brightness up and down from multiple devices. Recommend!